Youth Parliament is an apolitical program designed to help develop skills such as leadership and debating, with students representing their local areas as the ‘Government’ or ‘Opposition’. 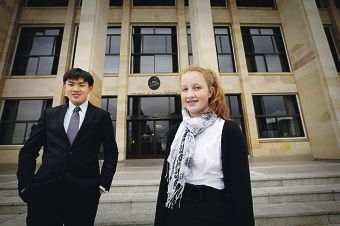 Louise and Jonathan were among the 59 students aged 15 to 25 from across WA who debated such topics as youth homelessness, electricity privatisation, sustainable urban growth and repealing mandatory sentencing laws for juveniles. Louise (15) said the program was a great opportunity for her to decide whether she wanted to take the path of politics later in life and discuss challenges young West Australians faced today such as the encroachment of social media. ‘(Social media) is influencing our futures as it has the power to make unimportant issues much greater than they really are, drawing us away from our studies and toward the unrealistic,’ she said.